ISBN 9783905476422. 9x12 inches. International (more than one language). DOWANI 3 Tempi Play Along is an effective and time-tested method of practicing that offers more than conventional play-long editions. DOWANI 3 Tempi Play Along enables you to learn a work systematically and with accompaniment at different tempi.Thefirst thing you hear on the CD is the concert version in a first-class recording with solo instrument and orchestral, continuo, or piano accompaniment. Then the piano or harpsichord accompaniment follows in slow and medium tempo for practicepurposes, with the solo instrument heard softly in the background at slow tempo. Finally, you can play at the original tempo to the accompaniment of an orchestra, piano, or basso continuo.Allversions appearing on the CD were recorded live by renownedsoloists, accompanists, and orchestras. There are no synthesised sounds in a DOWANI edition! 1-4 Largo5-8 Allegro9-12 Andante13-16 PrestoGeorg Philipp Telemann's Concerto for Viola String and Continuo TWV 51: G 9 In G edited for Viola and Piano by Leonid Leibowitsch. Book and Dowani 3-Tempi Play-along CD that contains full performance, backing and various tempo versions. 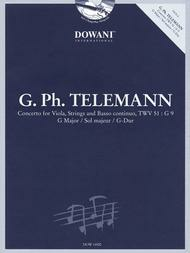 Georg Philipp Telemanns Konzert fur Viola, Streicher und Basso continuo in G-Dur ist eines der ersten bedeutenden Konzerte fur dieses Instrument. Telemann war einer der beruhmtesten Komponisten des 18. Jahrhunderts. Es handelt sich um einerevidierte Ausgabe: Zu der bereits bestehenden DOWANI-Aufnahme gibt es nun einen neuen Klavierauszug und die Solostimme wurde von dem Bratschisten Leonid Leibowitsch mit Fingersatzen versehen. 1-4 Largo5-8 Allegro9-12 Andante13-16 Presto.